Chef de Cuisine Matthias Buchholz is a passionate professional, whose impeccable pedigree includes beginning his training in 1983 at the age of 16. By 1986 he was working in Berlin at what would be the first of his many culinary experiences working at Michelin star restaurants. 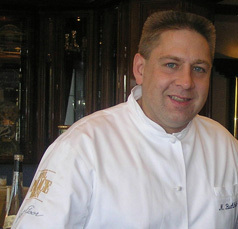 In 1988, he worked in Hannover, in 1989 he moved to Frankfurt and worked with Michelin-star chef Hans Haas in Frankfurt, where he saw there what he wanted to achieve. In 1991 he worked in Bargum and in 1996 he joined first floor. 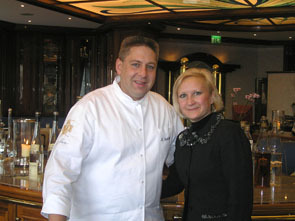 In 2000, he was named Berlin Chef of the Year, in 2001 GaultMillau named him Chef of the Year, in 2004, he received a Star Diamond Award from the The American Academy of Hospitality Sciences, and that is only a partial list of his credentials. Dedicated to all things culinary, he reads cookbooks in his free time, including his own collection of over 700 cookbooks including antique cookbooks dating to the 1820s. Where does he store all these books? There are two rooms dedicated to the books, and they are also piled on the floor. He enjoys traveling to get new ideas, and it seems that his daughter, age 3 years, has her own ideas when it comes to cuisine. She told him that frozen spinach is better than fresh, and that she also likes ketchup. As for Chef Matthias, a new trend for his cooking is mixing smaller dishes including Asian influences, French and typical German. He also enjoys the seasons of cooking, the morel season, the asaparagus season, the Périgord and white truffle season, and changing the menu to reflect the season. When I had lunch at first floor restaurant I had Ravioli with Smoked Pike-Perch with Horseradish Ice Cream, and I enjoyed it so much, that I asked Chef Matthias if he would share his recipe. The ravioli are delicate and served with the horseradish ice cream and beetroot crème it is a dream of a dish. Preparation: Remove the fish bones, add salt and sugar to the pike-perch, rub in the oyster sauce and let the fish sit for 24 hours. Smoke the fish for approximately 10 minutes. Preparation: Cut the smoked pike-perch in cubes. Stir in sour cream and add spices. Stir in the remaining ingredients. Refrigerate the perch until further processing. Preparation: Whisk in the egg yolks and salt with a splash of olive oil in a bowl. Gradually add the flour to avoid lumps. Finally, knead the dough with your hands until the dough has a smooth texture. Wrap the dough tightly in plastic wrap and let it rest in the refrigerator for at least 1-hour. Use a pasta machine to roll out the dough to make very thin pasta sheets. Brush the surface of the first layer of the pasta with an egg and place a 5-cm diameter of fish batter on the pasta. Top with another layer of pasta, press tightly and cut out the ravioli with a star cutter. Boil the pasta in plenty of salted water until tender, drain and gently stir in a small piece of butter. Preparation: Bring the milk and cream to a boil. Add the creamed horseradish, salt, pepper and reduced apple juice, bring to a boil and then let it cool. Briefly whisk the egg whites and stir them in the cooled batter. Bring the batter to a boil (no simmering) and let it cool immediately. Freeze the batter in an ice-cream maker. Preparation: Cook the uncut beetroot in salted water and caraway. When the beetroot is soft, peel it, chop it into small pieces and blend it in a blender to a very fine purée. Sauté onions, leeks, celery sticks and celery bulb in butter. Add salt, pepper and white wine. As soon as the white wine has been totally reduced, add the broth and cook the vegetables until they are soft and tender. Add the cream, and bring it to a boil, and then blend and strain, and season to taste. Shortly before serving, stir the puree into the light-colored soup, bring it to a boil and season it to taste. 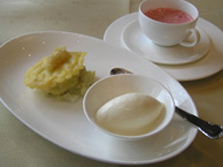 Presentation: Place the ravioli on a plate and serve the horseradish ice cream in a small dish next to the ravioli. Pour the beetroot creme in a small teacup. Please read the articles on first floor in the Restaurants and Chefs' Recipes sections, and articles on Berlin in the Destinations, Hotels & Resorts, Restaurants and Music Scene sections. © June 2006. Luxury Experience. www.luxuryexperience.com. All rights reserved.